How to update the downloaded Maps using MapUpdaterTask in Windows Phone? Q&A #28 – What font is used in Windows Phone UI? In one of my previous blog post, I explained the use of the MapDownloaderTask in Windows Phone. In this blog post, I will explain how the developers can use the MapUpdaterTask in Windows Phone to update the Maps. The Windows Phone SDK provides the Launcher “MapUpdaterTask” that enables the users to update the map that was downloaded earlier. 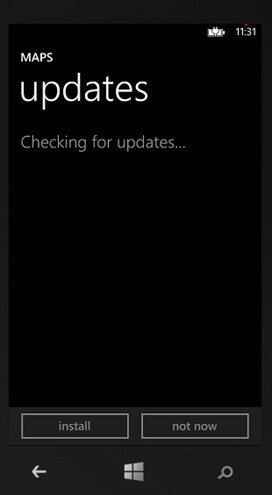 Updating the downloaded Maps in Windows Phone is easier. Just create an instance of the MapUpdaterTask and call the show method of the MapUpdaterTask. MapUpdaterTask’s show method will launch the Maps settings app. This will search for the updates for the Maps that were installed previously for offline use and displays if there are any updates available for those maps.